The integrated performance doorset concept is the next logical step in the development of performance doorsets. By incorporating all of the essential ironmongery the performance of the doorset can be guaranteed. This includes all recessed ironmongery and anything that interrupts the seals within the doorset, such as: closers, hinges, flush bolts, locks, flush pulls, electric locks and armoured loops, mag locks, transom spring closers and floor spring closers. New product development manager Stephen Hutsby explained: “The integrated doorset concept is about making sure all of the components of the doorset are fit for purpose and work together to ensure it meets the required performance levels. Because all of the components are put together in a quality-controlled factory environment the performance is guaranteed and delivers increased onsite quality and time savings”. All Leaderflush Shapland’s ranges – Plasform, Designer and Extended Performance – can be provided as an integrated solution. The skilled team at Leaderflush Shapland take a collaborative and flexible approach using their technical expertise and knowledge of the sector and market to work with architects, specifiers and contractors at the design and specification stage to provide ideas and solutions to ensure the right products are specified for relevant applications. 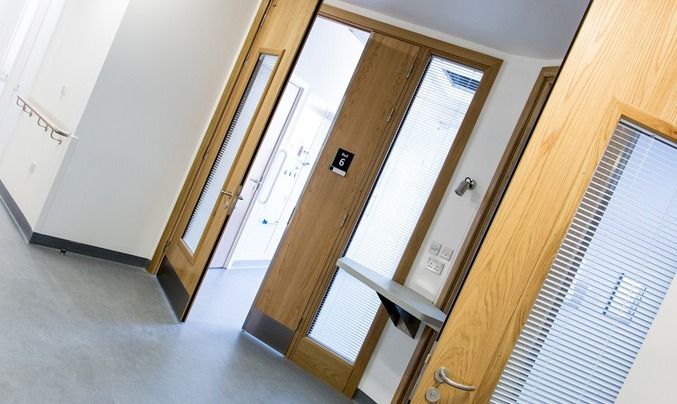 In order to maintain choice, design freedom and the ability to create the aesthetic concept of building interiors, architects and specifiers maintain control over non-performance surface mounted ironmongery and are therefore not limited to a prescribed range, except in specialist areas such as mental health where anti-ligature ironmongery is necessary to meet performance requirements.